The weather has finally started improving so I decided to take advantage of one of our warm April days in the DC area. The temperatures were approaching 70 degrees when I arrived at a local Maryland stream. I’ve always stayed away from streamer fishing, but lately, I’ve decided to work on my presentation. I wondered if my lack of interest is a result of my lack of streamer skills, or if I truly don’t like fishing those flies. I’d say it’s a mix of both. My last couple of outings, I chose to exclusively use a Zonker style streamer or the trusty Wooly Bugger. The truth is that I caught a lot of fish on these flies, but not nearly as many as I have when nymphing. 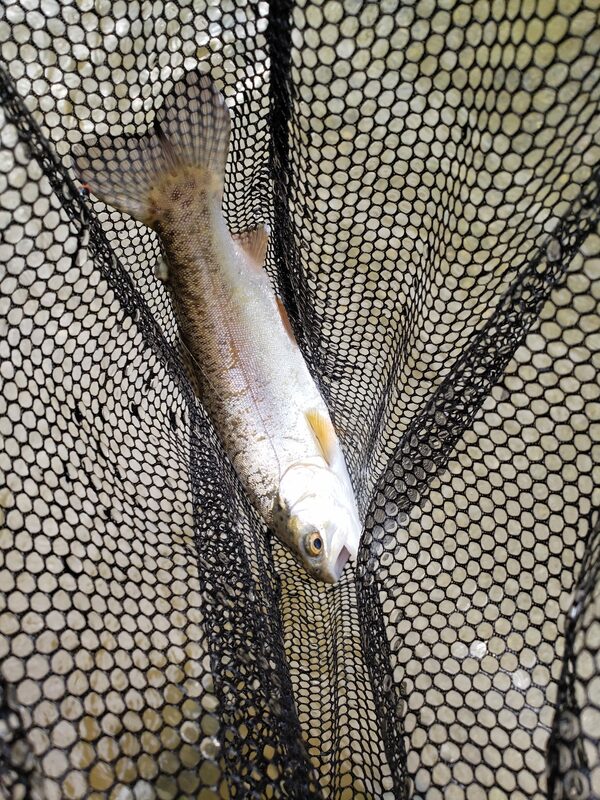 One thing I did learn from fishing streamers is that I still love catching fish on a swinging fly. The tried and true method of casting across and letting a fly swing across and down from you is a beautiful, simple, fish catching machine. When I arrived at this Maryland stream, there were a few bugs flying about, but no fish were feeding on the surface. I decided to tie on a inch worm pattern and a caddis nymph below it. Both were getting a ton of interest, and I often find that the second fly catches more fish in general. It may be because it’s lower in the water column. I started out fishing a deep seam of water in a narrower portion of the stream. These types of areas are perfect for tightline nymphing. It’s easier to get the flies down and the steady current makes it easier to tell when a fish takes the fly or you’re stuck on the bottom. I was only a handful of drifts through the seam when my leader hesitated a bit. I quickly set the hook and immediately felt the fish digging down deep. After a minute or two, I was finally able to get the fish to relax a bit and guided it into gentler water. The fish was probably one of the biggest brown trout I’ve caught in this area. 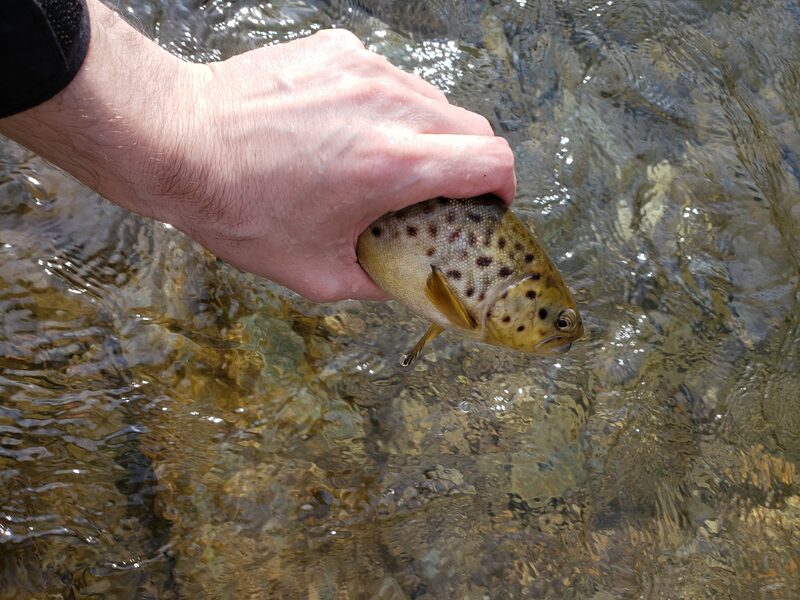 I’m always glad to see healthy brown trout, because they are such a hardy fish and can better withstand warming water temperatures in the summer. Excuse the finger blob. Excited to see this fish and wanted to release it quickly. 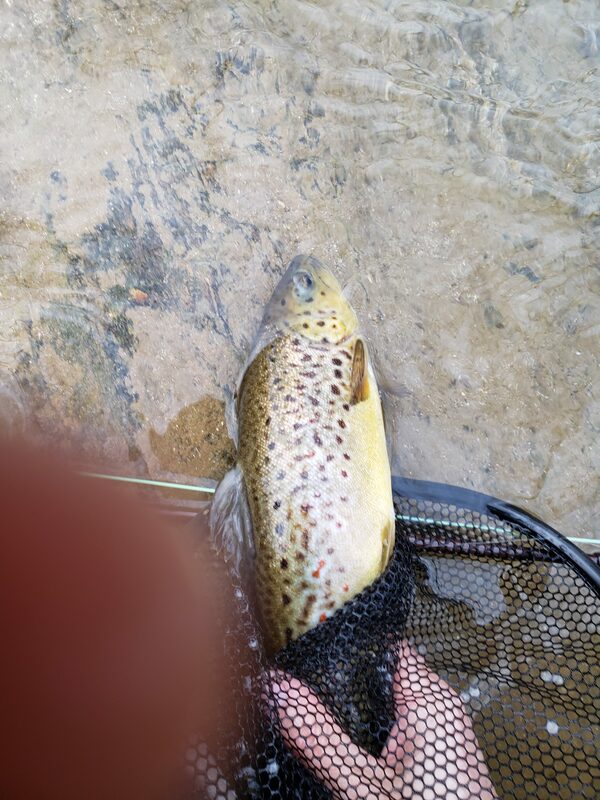 I continued to fish the area and caught a few more brown and even a couple small rainbow trout. All of the fish seemed to prefer my size 16 caddis nymph over a stone imitation I had tied above it. Towards the end of the day, I even started to see a fish rises and some emerger activity. Late spring and early summer remain one of my favorite times to go fly fishing outside of the fall months. I didn’t try any dries on this outing, but the time is approaching. Here are a few more photos from the day.